This counter height chair will perfectly compliment your home with any decor, creating a touch of elegance and sophistication. The chair not only will perfectly compliment your decor, but will allow you to eat every single meal in comfort with thick upholstered seat and back cushions. 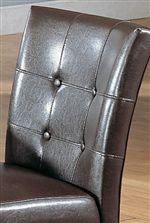 The chairs' design stands in the tufted seat backs finished with a stitching design on the other side. Slender tapered legs with stretchers allow the design of to stand out with poise. Pair this counter height chair with the coordinating table to achieve a complete composition for your dining room, kitchen, or any other casual eating area. The Canville Counter Height Chairs with Upholstered Seat and Back by Acme Furniture at Carolina Direct in the Greenville, Spartanburg, Anderson, Upstate, Simpsonville, Clemson, SC area. Product availability may vary. Contact us for the most current availability on this product. Create a captivating effect in your home with the 7059 collection of dining room pieces. Composed of counter height pub table, counter height chairs, and a marble top buffet (not shown), these pieces will give you all you need to achieve poise and elegance in your home. This collection also features clean straight lines and tapered slender legs creating a refined contemporary look. 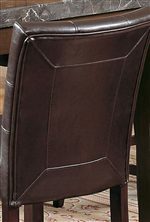 The pub chairs will not only enhance the look of your home with tufted seat backs, but provide you exemplary comfort with the thick upholstered seat and back cushions. Completing your formal dining room has never been so easy before, everything will look amazing together and beautifully blend into any decor of your home. Either you want to create a modern touch your beautiful dining room with a contemporary look, or dress up any informal eating area with the elegant design, this collection will look amazing in your home with any decor. The Canville collection is a great option if you are looking for Contemporary furniture in the Greenville, Spartanburg, Anderson, Upstate, Simpsonville, Clemson, SC area. 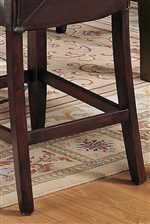 Browse other items in the Canville collection from Carolina Direct in the Greenville, Spartanburg, Anderson, Upstate, Simpsonville, Clemson, SC area.